I've been asked to explain the various codes used on the Horizon labels, our own web page describing these having fallen far behind, sadly. Updates added in blue following publication of a list on the Stampboards forum. I've no idea of the full range of codes originally used when the system started in 2002. 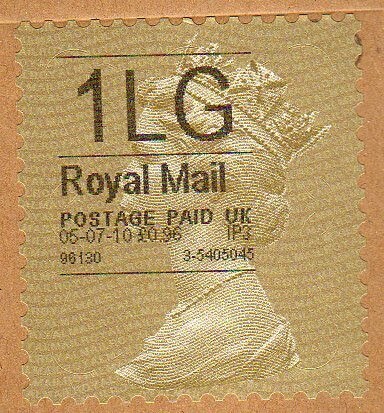 There was 2ND and 1ST for 2nd class and 1st class inland mail, and P for inland Parcels. SD was used for Special Delivery, but Recorded Delivery passes as 2nd & 1st as it has no priority treatment. A for Airmail, and S for Surface were other commonly found usage, though as these went on international mail there are not many to be found here. From 2003 the indicators went to lower case and as the normal designations didn't comply with Welsh language designation, so for bilingual labels we have different ones for Welsh offices: 2nd 2il 1st 1af. AX is used for the Airsure service, but no special indicator is used for International Signed For, even though both are used as substitutes for the obsolete Registered service. 1st - only for Articles for the Blind as no labels are produced for items under 100gr and any other mail over 100gr is a Large Letter. FP - Fully Paid Reposted Underpaid Airmail (items returned to sender for additional payment). FF - I've not seen one of these, but I assume that it may be for Forces Free, sent to British Forces 'in theatre' in Iraq and Afghanistan. Confirmed as Forces Freepost.